Today I took a meditation hike. 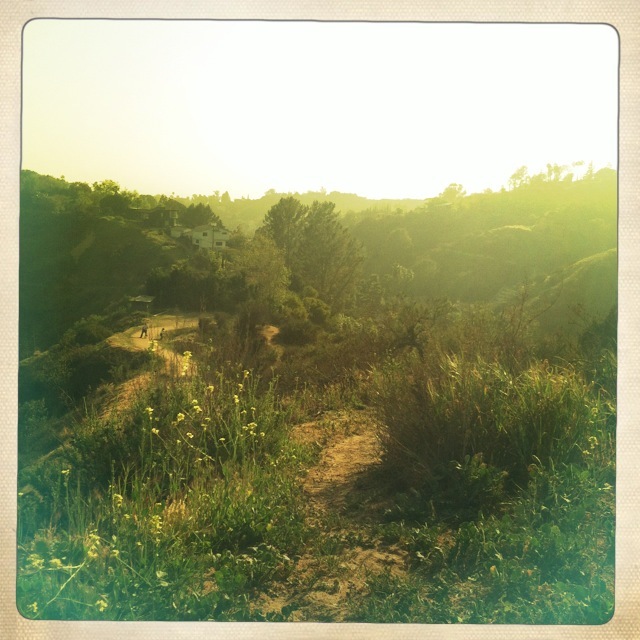 I listened to Vive’s album, Chakra Songs, and ended my walk on top of a ridge at Hollyridge trails. I thought a lot about love up there and what can sometimes keep us from being able to love in the way we want to. Maybe you’re like me and have certain familiar walls up that impede the exchange of love between you and others. And by love I mean love that moves no matter context, no matter mood, no matter consequences. The “do unto others” and “turn the other cheek” kind of love. Today I decided that I’m tired of my walls. My walls have been defending me for a long time. Letting those come down puts me in all kinds of harm’s ways. Unfortunately, those same walls also keep me locked in. I want to be liberated. I believe that God is pure pure pure love. There is no other ingredient in God but love and there is no other source of love but God. I believe that God’s love is unconditional. I know that showing and receiving that kind of love isn’t something you can fake or really even learn. Perhaps allowing (as opposed to concocting) unconditional love to flow in and out of me–which is really what it (i.e., God) wants to do anyway–is THE ultimate defense and simultaneously the ultimate liberation. I’ve never thought of it that way. I’ve always thought that to love others meant letting myself get hurt and that somehow I would have to grin and bear that. It always meant being a martyr. Moreover, it was something I had to work really really hard at doing. But imagine answering hate with genuine love, answering betrayal with genuine love, answering neglect with genuine love. Imagine having a response of love be your nature. Why can’t it be so? One thing I have learned from years of trial and error, is that just saying a genuine “YES!” to what you feel bubbling up inside you makes the heavens and the earth respond. Things begin to happen. Changes occur. I have felt something bubbling up in my spirit and it has to do with this question of love. A new understanding is brewing. So be it. Here I Am! A woman offering up her heart for the divine intentions inside and outside of me to do what they will for love. I say YES to the challenge of letting old defensive walls crumble, and I know that the universal response will not disappoint. I surrender my human efforts and wait for a path to appear. Let’s see what happens! Thank you! Have you ever written a post and then wondered if it made any sense at all?? lol! I’m glad to know you liked it. Oh, indeed I have – like every time. I’ll share one of my favorite quotes. I think you did a bang up job putting your thoughts into words. Thank you. 🙂 I love the quote you shared. So true! Thank you! I’m glad you liked it. Maya Angelou is such a beautiful voice, isn’t she?